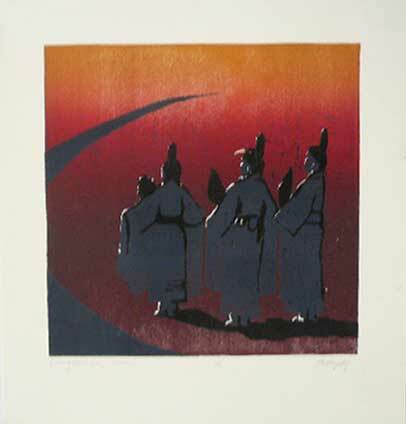 This reduction block print is a very strong, evocative image. George Longfish, renowned painter and educator, has created high quality digital prints on heavy paper from his paintings. The Bureau of Indian Affairs has been a maze for the Indian tribes for too many years. Longfish depicts a maze in quadruplicate, where an Indian with a feathered cap is merely a hazy (sideways) image within. This print is 12" x 12". Prints can also be ordered in custom sizes. Please call 207 967-2122 for more information. George Longfish, renowned painter and educator, has created high quality digital prints on heavy paper from his paintings. 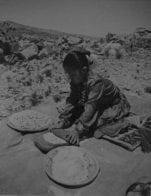 The Bureau of Indian Affairs has been a maze for the Indian tribes for too many years. 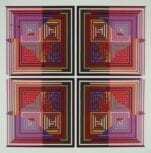 Longfish depicts a maze in quadruplicate, where an Indian with a feathered cap is merely a hazy (sideways) image within. This print is 17" x 17". Prints can also be ordered in custom sizes. Please call 207 967-2122 for more information.